RAIA is a research initiative launched in 2017 dedicated to exposing the connections between American and Israeli state violence. Our work is grounded in the conviction that the ongoing dispossession and oppression of the Palestinian people undermines the possibility of a viable homeland for both Palestinians and Israelis. Embracing the 2005 Palestinian call for Boycott, Divestment, and Sanctions (BDS) against Israel until Israel ends its Occupation, grants full equality to its Palestinian citizens, and honors the Palestinian right of return, RAIA is committed to conducting research for the movement for justice in Palestine in the United States….RAIA seeks to raise awareness of the close collaboration between the Israeli and American governments to displace, surveil, and control communities of color and other marginalized populations in order to suppress popular resistance. 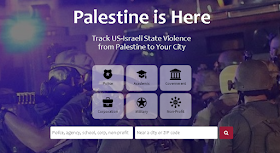 The Palestine is Here site is another in a long series of well-organized initiatives meant to turn the very word “Israel” into a viscerally horrifying term. There is nothing wrong with US police attending seminars given by Israelis, which is the “crime” that the site is most concerned with now. As I’ve pointed out before, each US police department is responsible for its own rules of engagement, and taking a seminar in Israel doesn’t make them change their policies. “Palestine is Here” is a sick attempt to blame Israel to domestic US problems with the aim of ensuring that stupid liberals will link hating Israel, the most liberal state in the Middle East and one that can claim in many ways to be more liberal than many Western European democracies, with all the causes they hold dear.